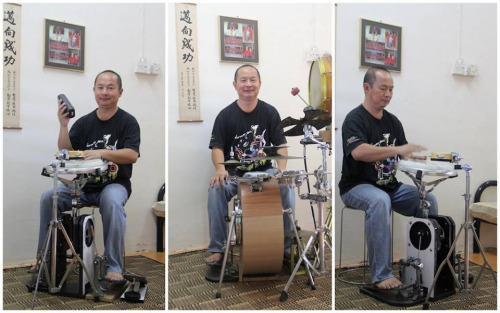 Peter Lau is a well known Recycler, Mountain-biker, Drummer in the Roger Wang Trio and one of the most innovative Compact Drum Kit Makers ever. 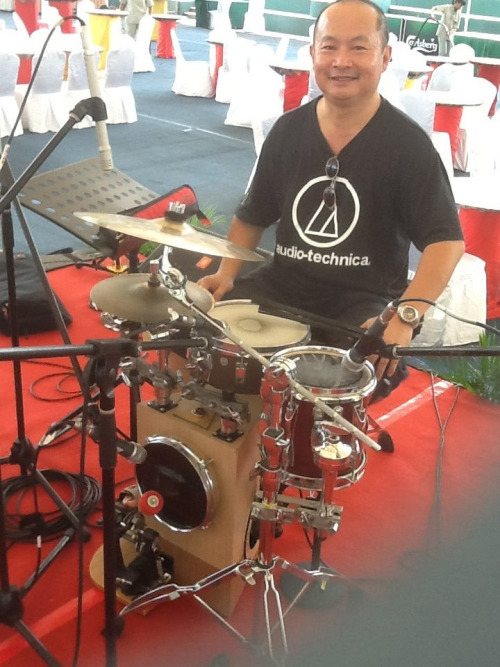 Some 15 years ago Roger Wang approached Peter, asking him to drum “quieter”. 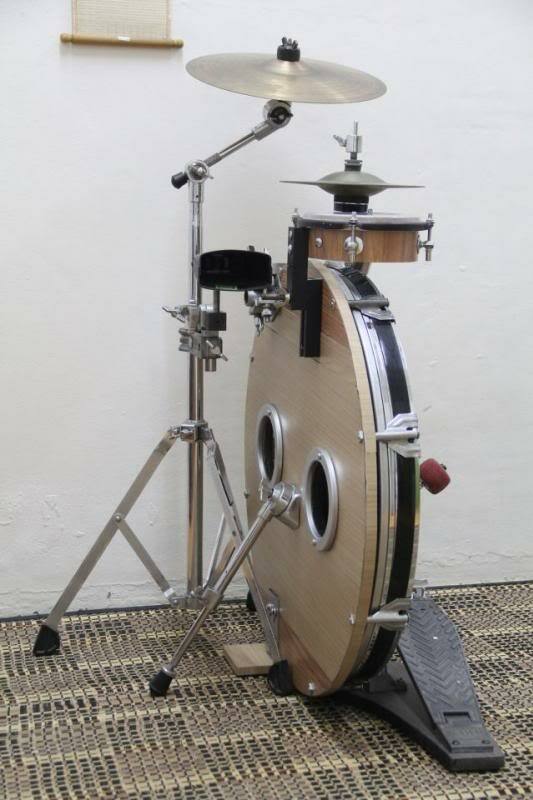 Peter didn’t settle for simply drumming softer, he came up with a whole new drum kit design that also got substantially smaller. 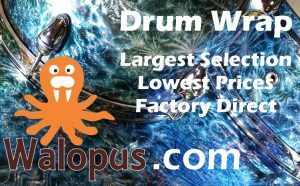 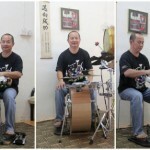 Through the years Peter Lau has created countless incredibly innovative compact drum kit designs. 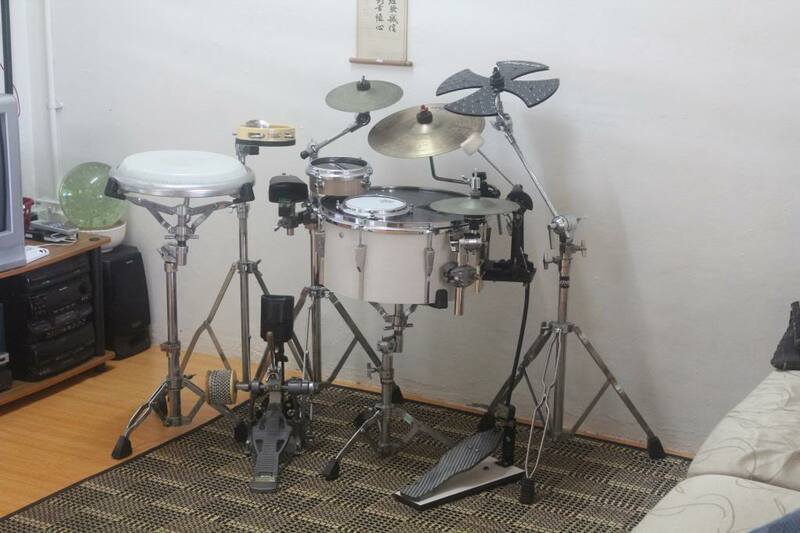 Most, if not all of his drum kits can be carried in one trip from vehicle to venue. 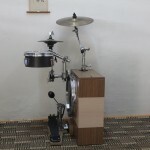 The DIY spirit Peter displays is inspiring. 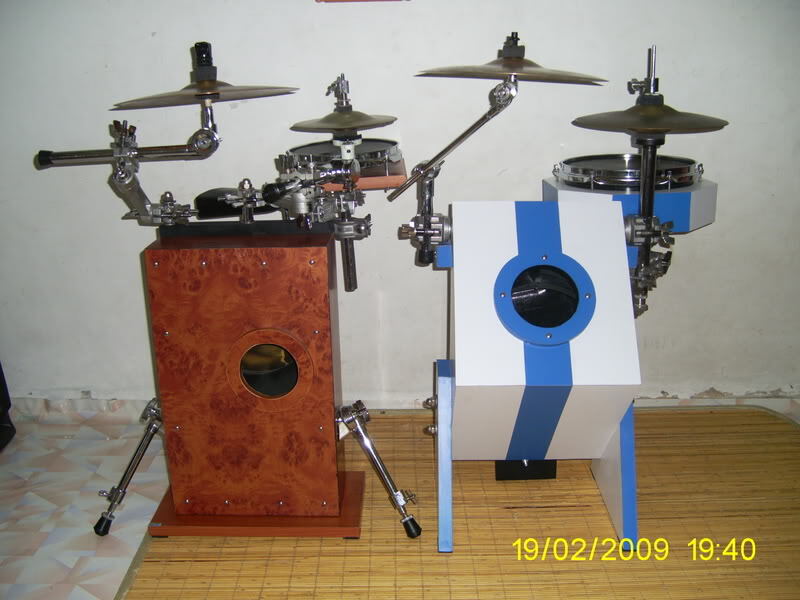 As is the innovative use and re-use of various items incorporated in his creations. 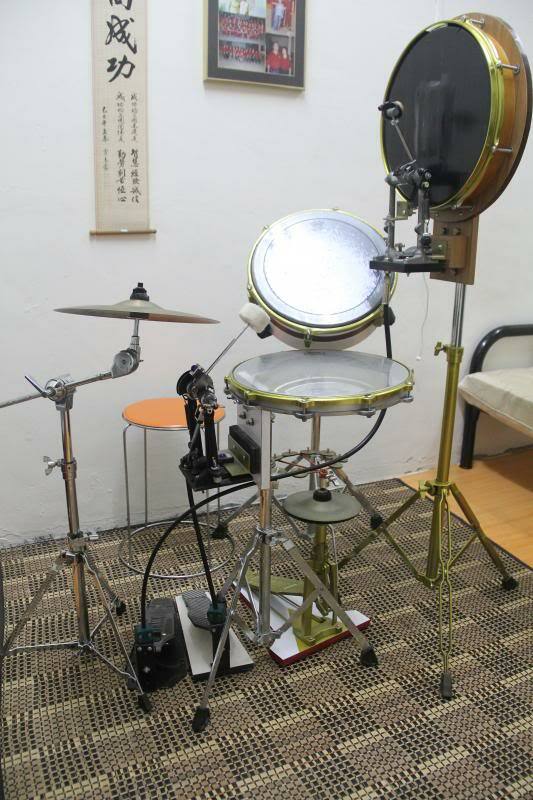 Sit back, enjoy and let this collection of Peter Lau’s Innovative Compact Drum Kits inspire your own inner DIY creativity. 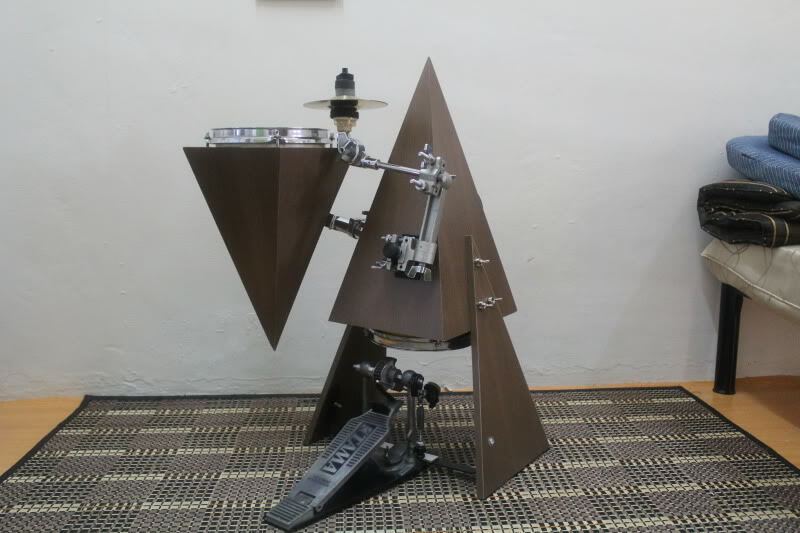 Yet another triangular bass drum but with a new angle on the orientation and a completely unorthodox arrangement altogether. 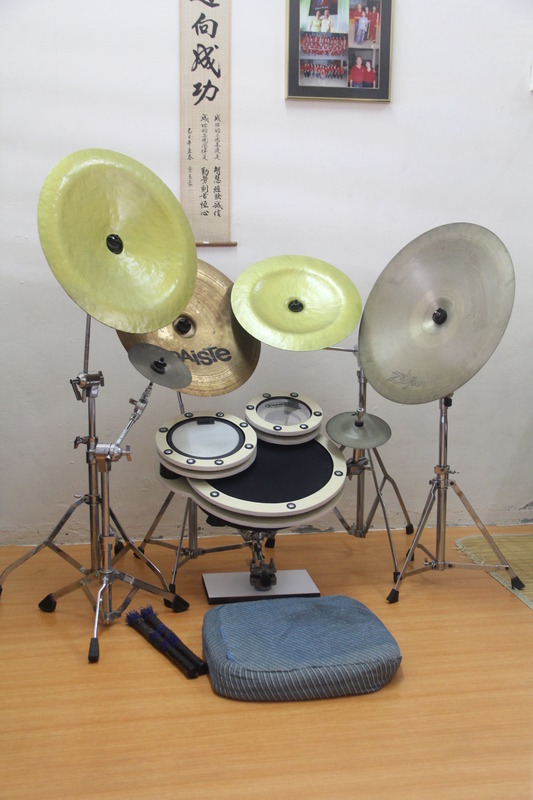 After viewing a few of Peter’s rather unusual configurations, this kit almost looks regular. 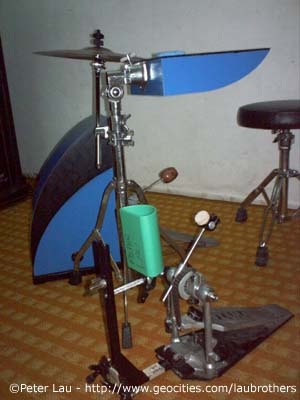 Note the pedal attachment/spur. 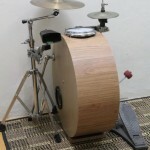 One of the “drums” on this one has it’s own built-in drumstick! 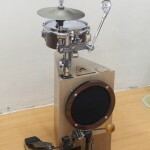 The little tambourine-like gadget makes a nice hat-substitute. 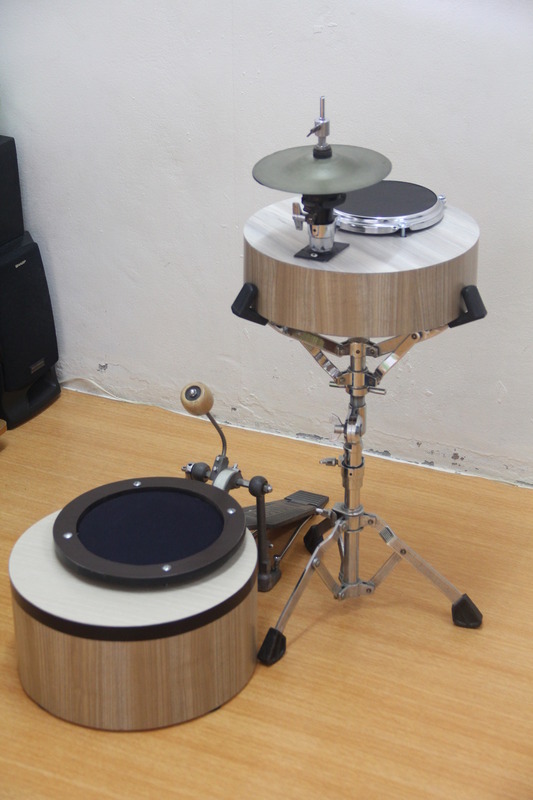 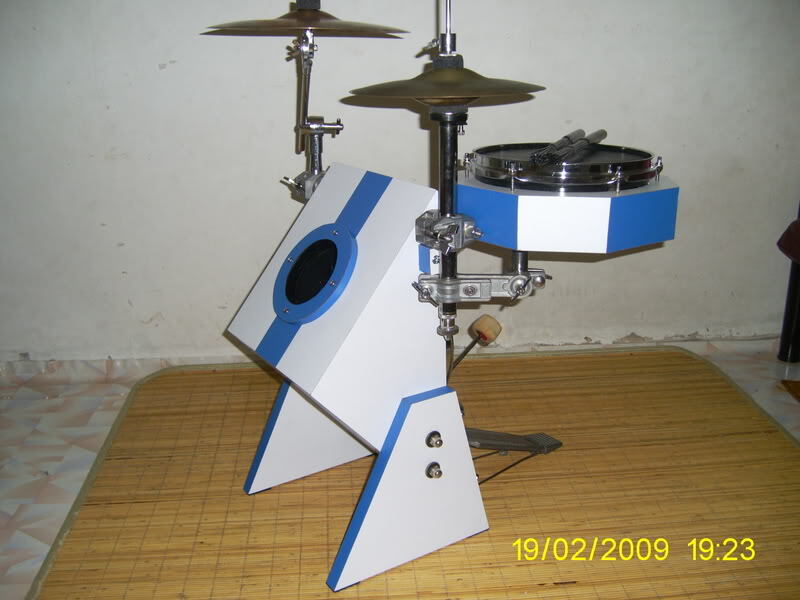 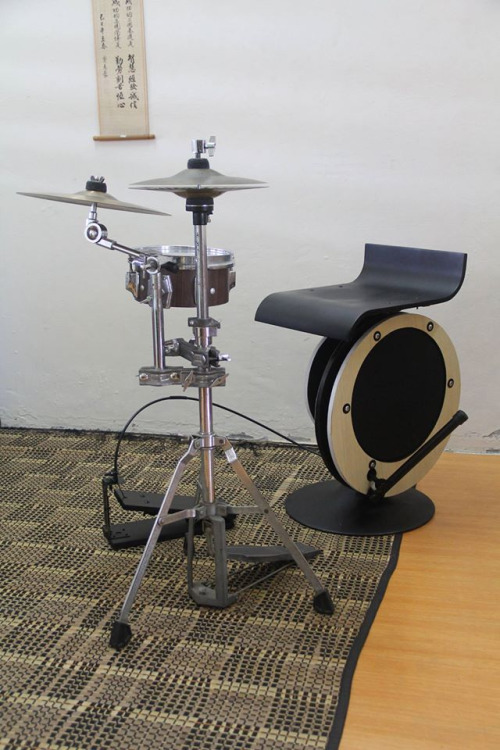 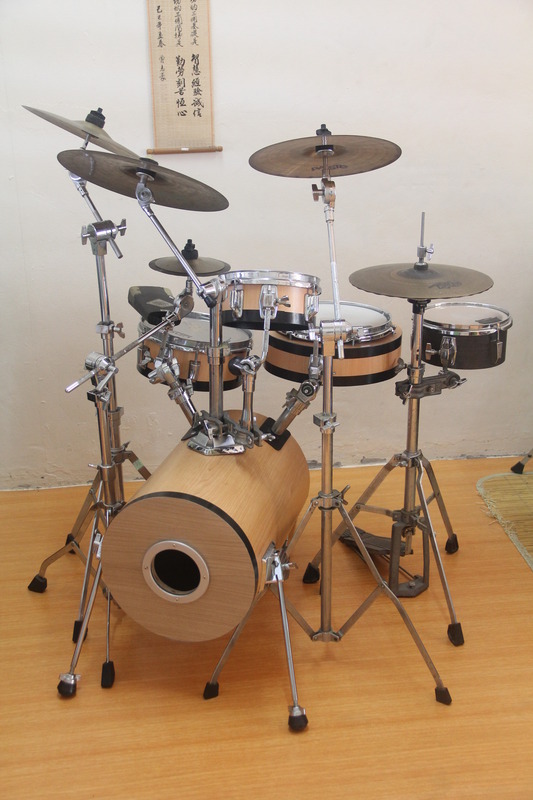 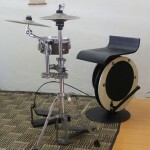 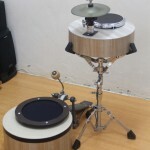 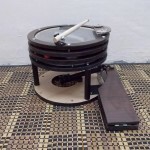 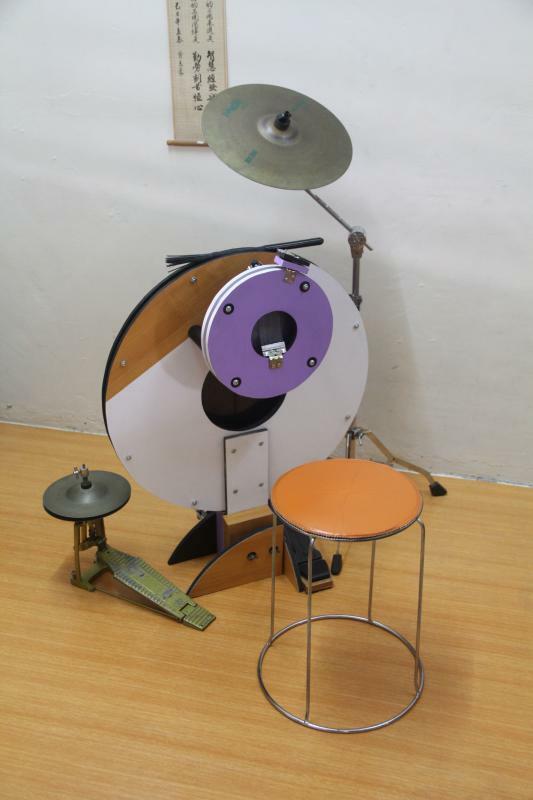 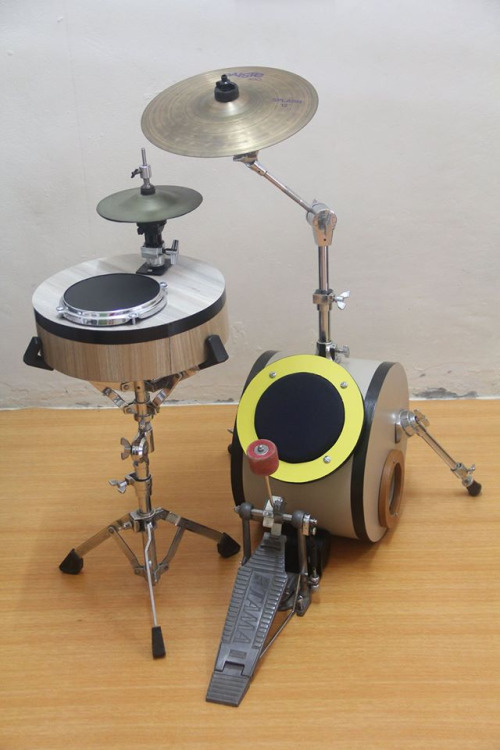 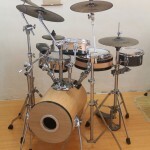 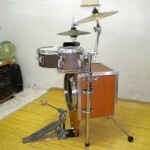 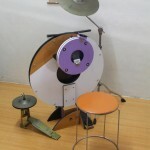 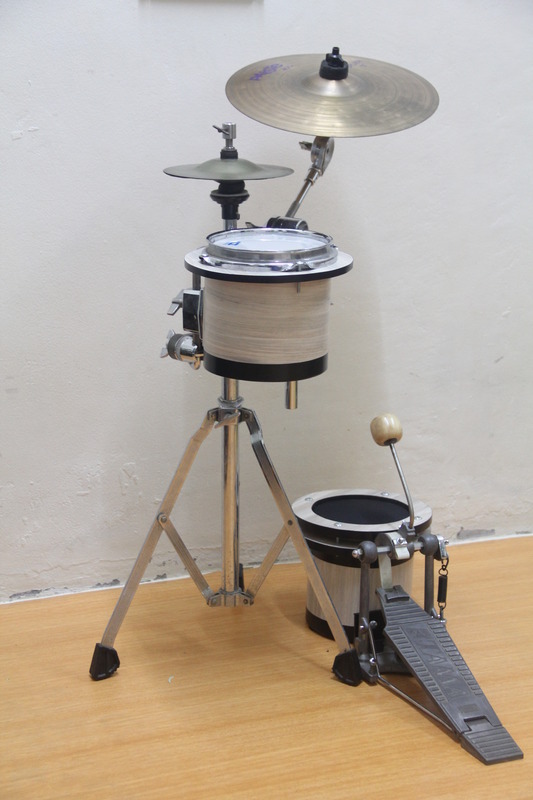 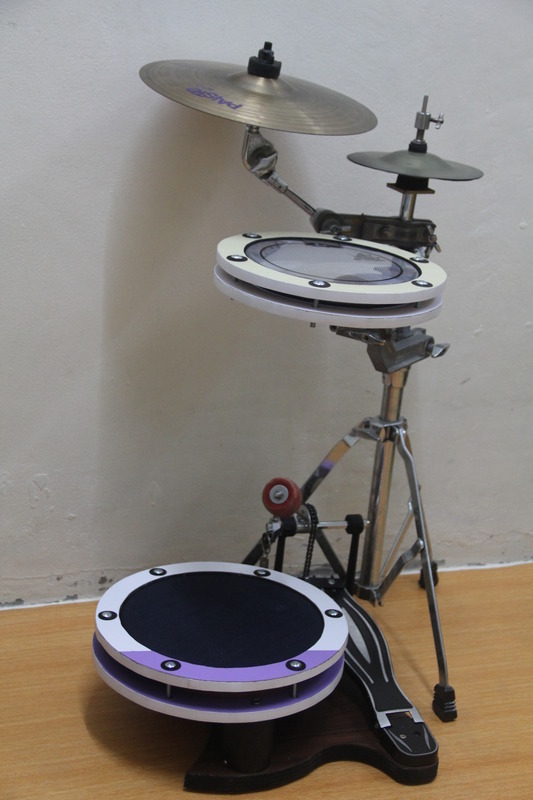 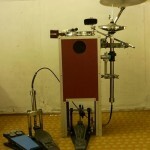 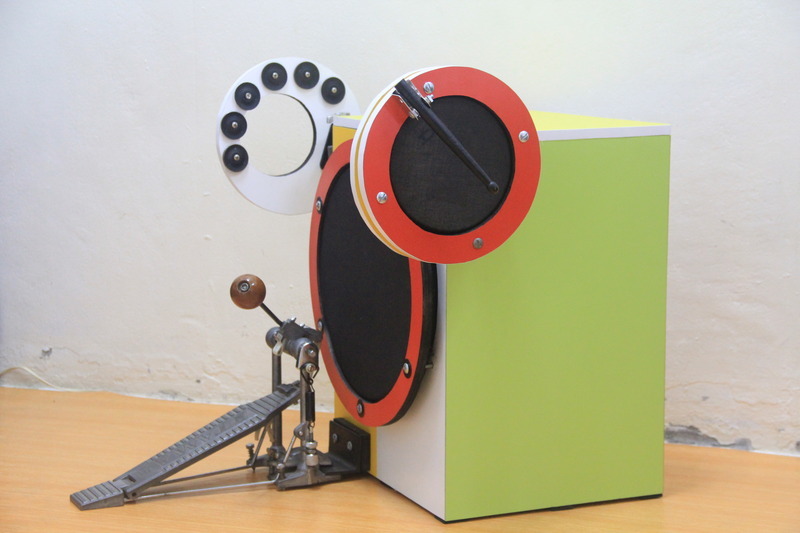 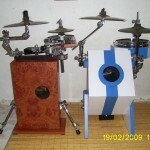 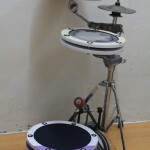 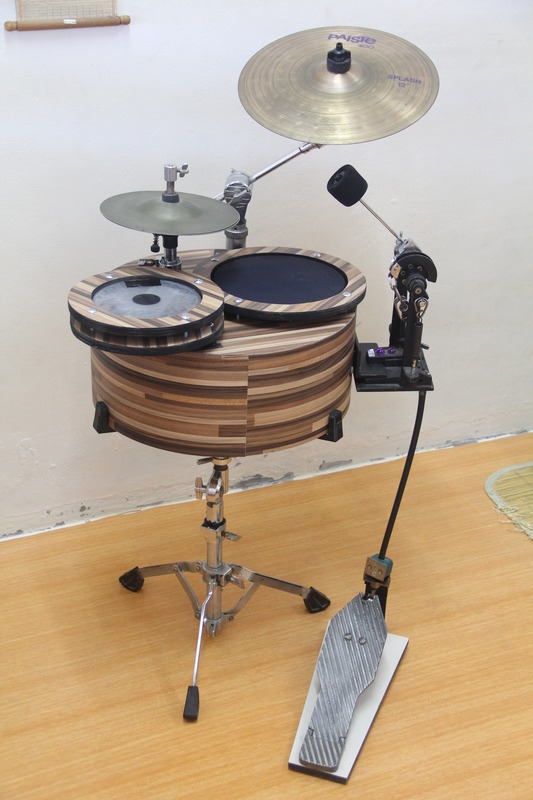 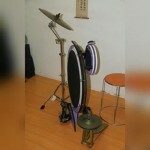 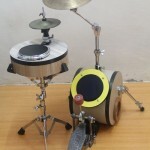 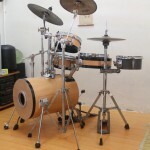 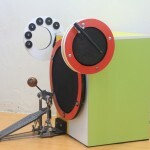 Here we have a “boxtail” drum kit with a DIY remote hi-hat pedal and a tambourine pedal. 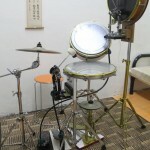 An entire collection of Peter Lau’s innovative and creative compact drum kits. 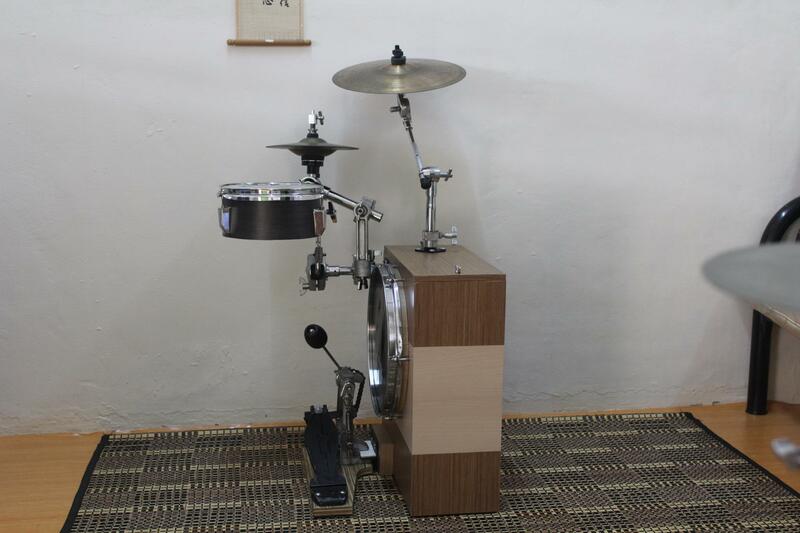 Incredibly sleek configuration with a downwards beating pedal. 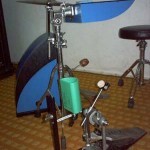 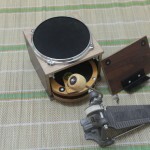 Another variety with a downwards beating pedal and with a drum-shell within a drum-shell design. 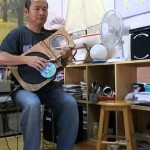 Note the DIY hoop design that is one of the identifiers of a “Peter Lau Original”. 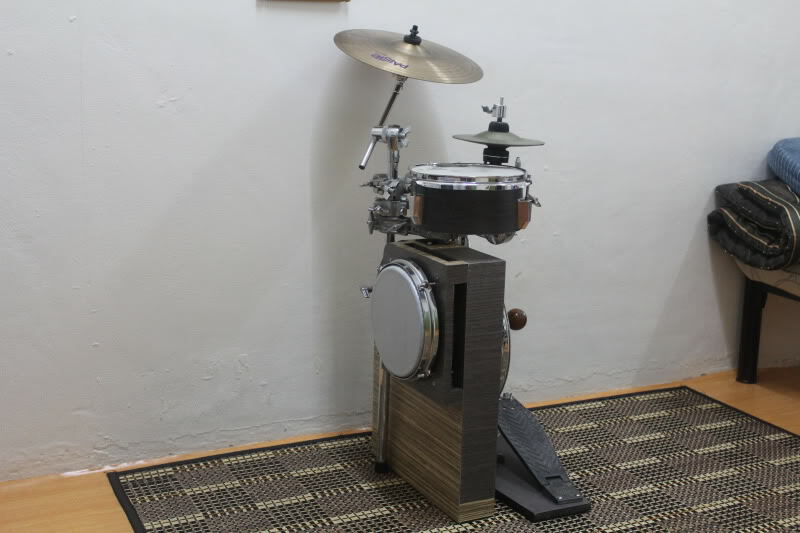 Here’s a slick little floor kneeling set-up. 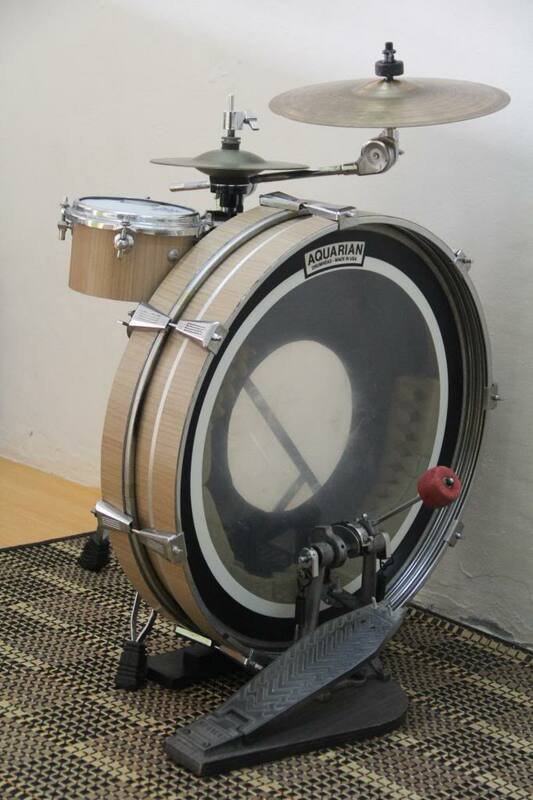 Perfect for praying to the drum gods. 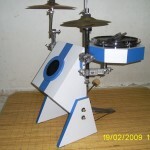 Another angle of the triangular style bass drum with the audience facing beater. 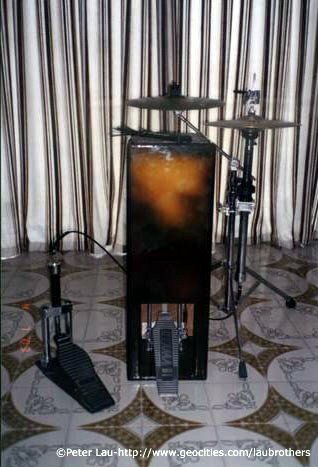 Note the bass pedal configuration. 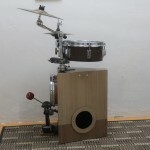 Peter has designed numerous “box tail” style kits. 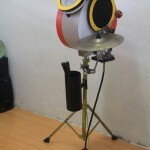 Here’s another one with a DIY remote Hi hat stand. 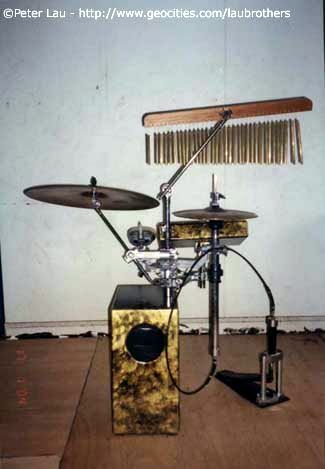 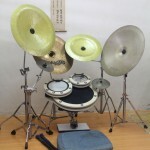 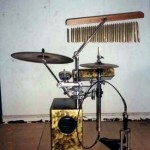 Yet another boxtail drum set with remote hi-hats and a set of chimes. 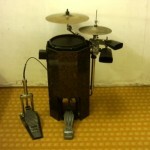 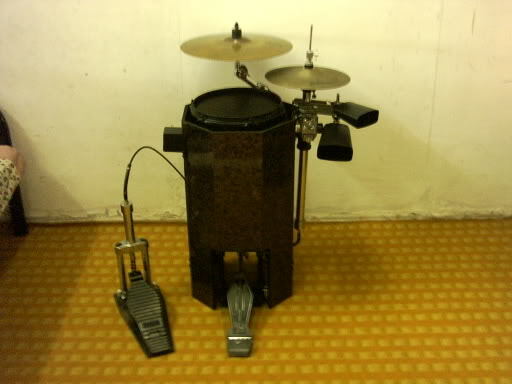 Highly unusual drum set design with a foot pedal operated “wood block” of sorts. 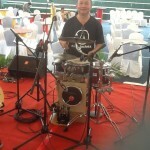 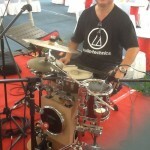 Peter Lau gigging his triangle bass drum, mini drum kit. 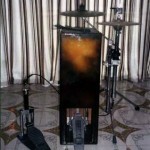 Here you can see how the beater is visible to the audience. 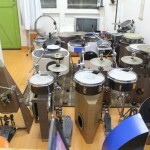 The audience facing beater again from a slightly different angle. 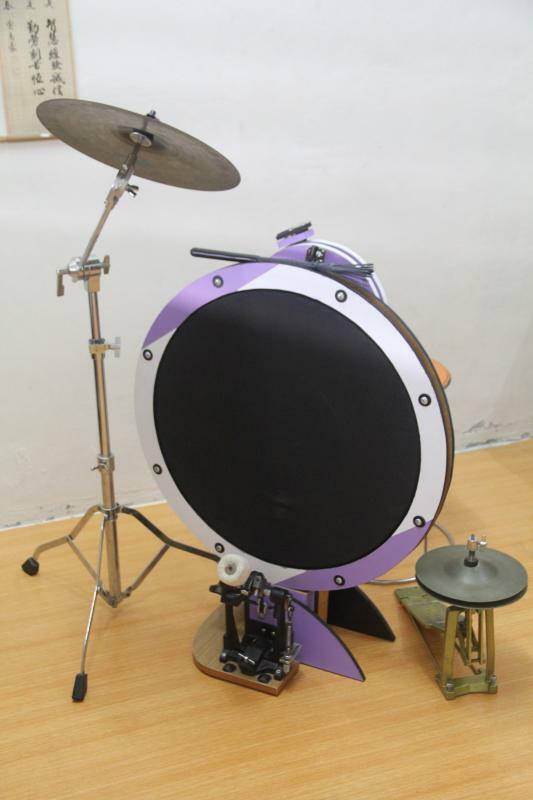 Handheld drum kit played kind of like a guitar. 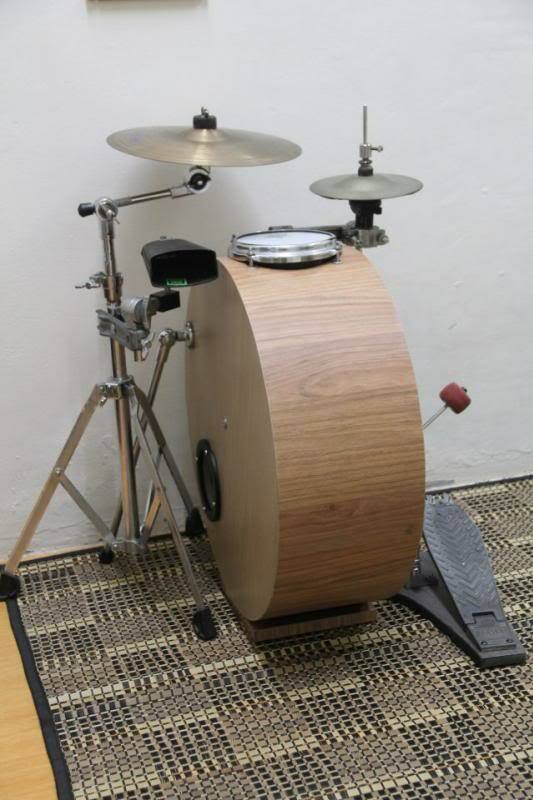 Perfect for bringing to a small jam. 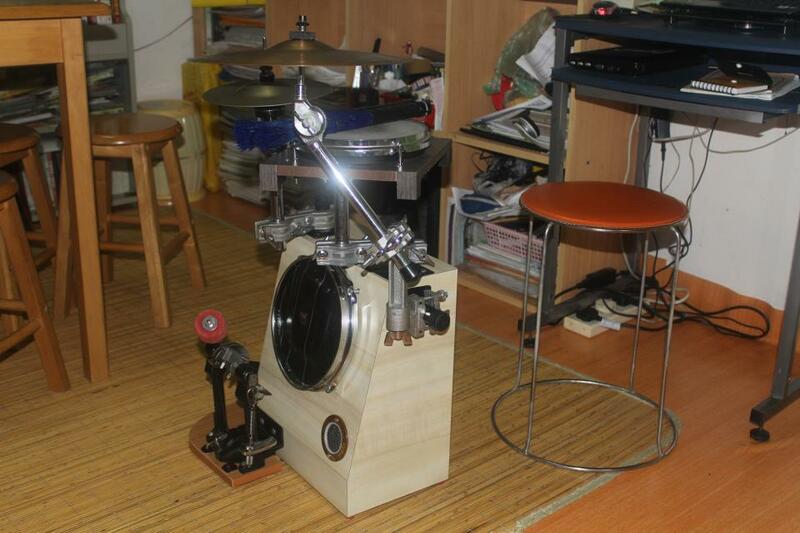 DIY remote bass pedal operating a drum-in-a-drum. 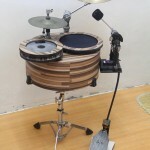 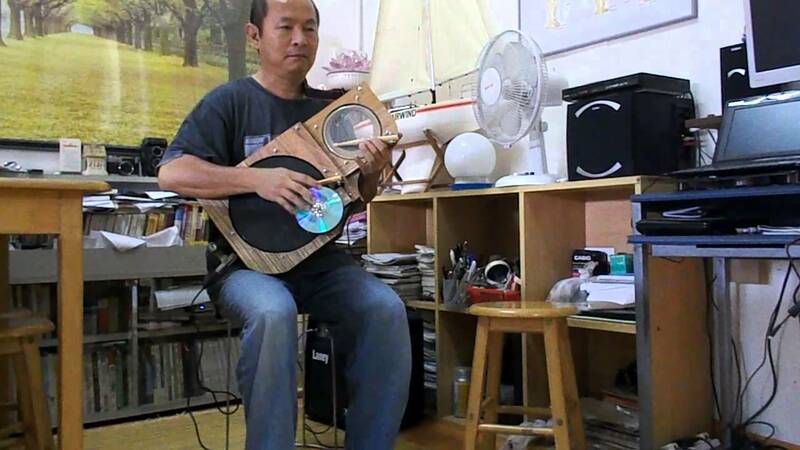 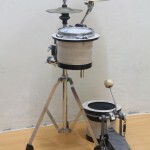 Made from sewer pipe, this kit sorta’ borrows some aspects from yamaha’s “HipGig”. 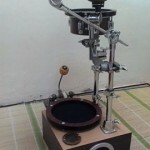 Another innovative creation made from sewer pipe. 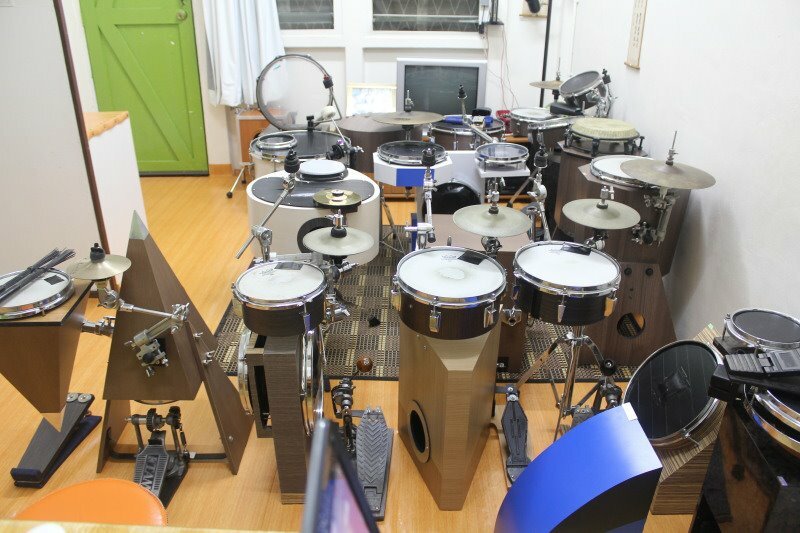 This one a bit less traditional. 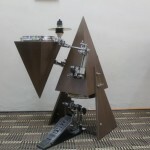 One of Peter’s most recognized kits, the “Opposed pyramids”. 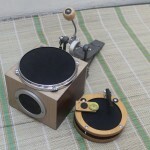 Note the closed mini hats. 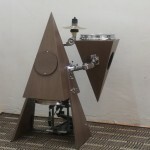 The pyramids from the driver’s seat. 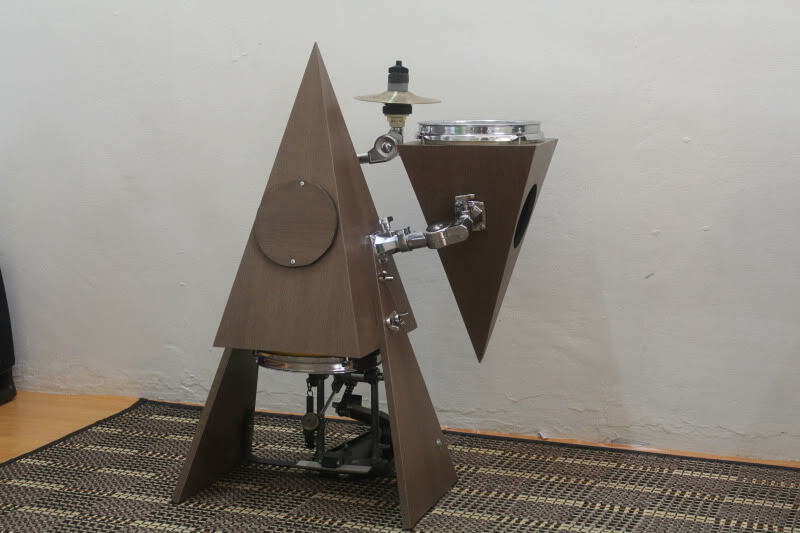 Aesthetically balanced yet provokingly unorthodox. 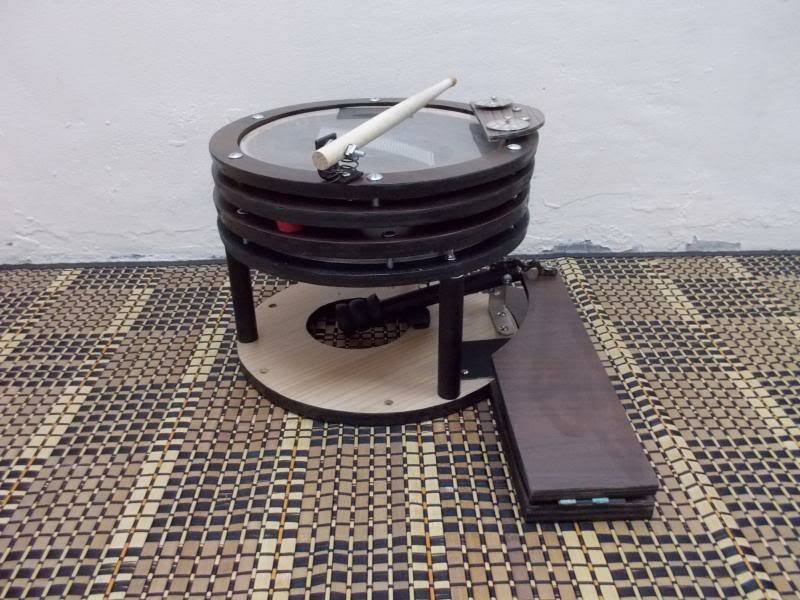 The opposite drum kit with the bass drum up top, operated by another DIY remote bass drum pedal, using an automotive clutch cable. 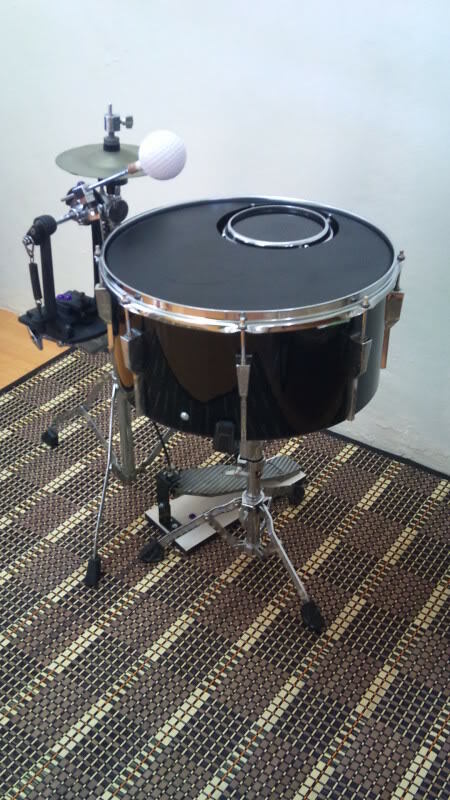 The tiny snare drum resides inside the bass drum. 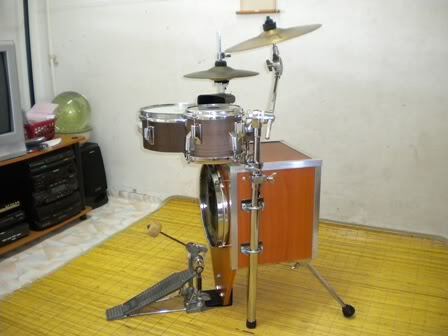 This one also operated with a DIY remote bass pedal. 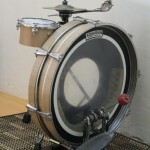 Here the snare and bass drums share a mutual shell. 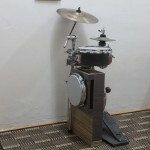 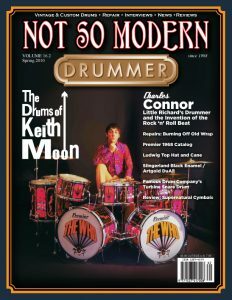 Slim-style, drum kit with a unique “low-hat” configuration. 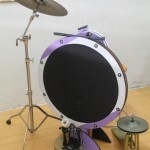 Another slim-style. 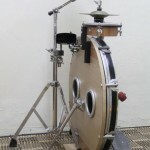 This time sideways with dual bass drum ports. 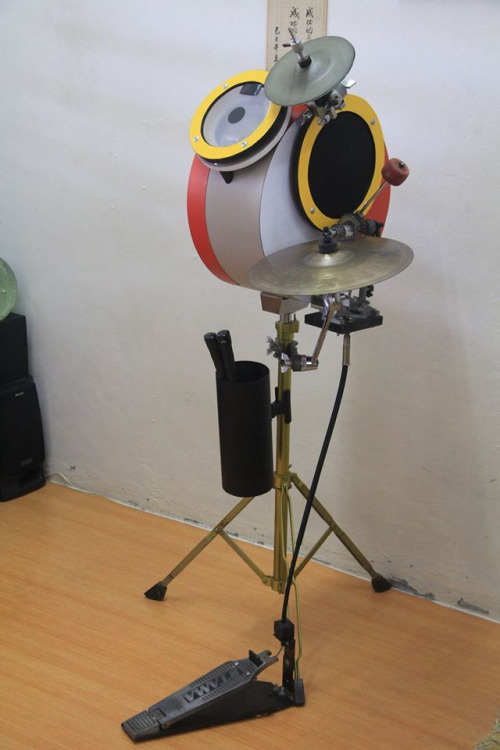 Ultra compact portability with a full-size bass head. 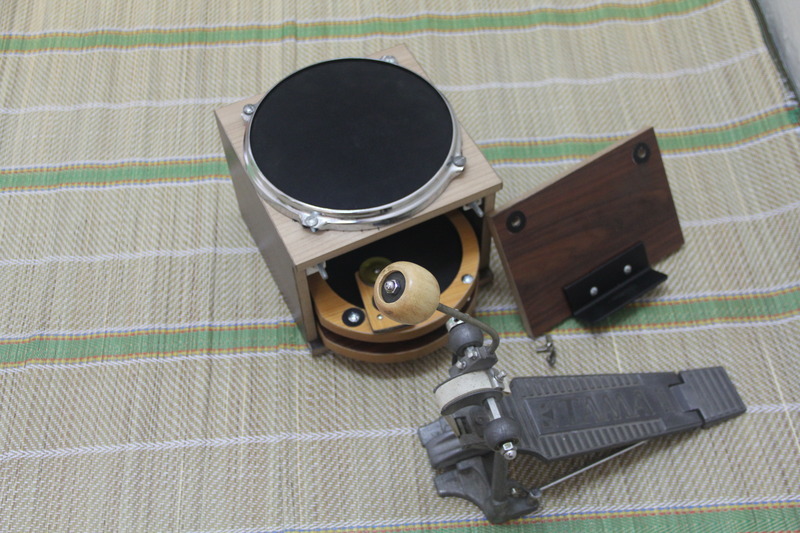 Slim-style sideways of a different variety. 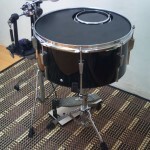 Single bass port and dual “heads”. 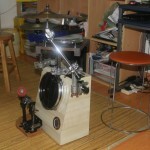 Driver’s side view of the “thin line”. 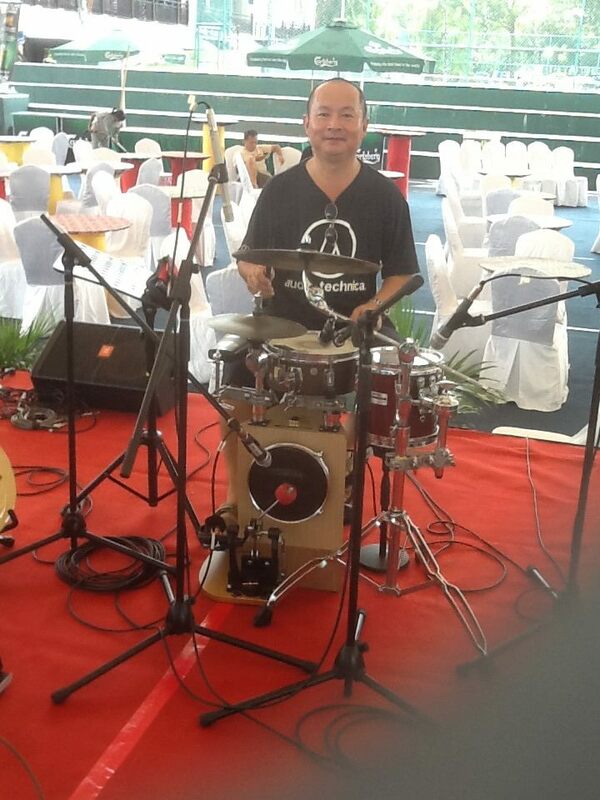 Note the quite unusual snare drum set-up. 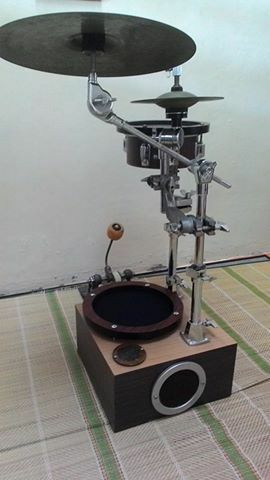 A whole new take on the cocktail drum kit. 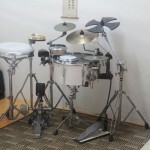 Stand up like a cocktail kit, but with a sideways configuration and all rigged up on a single stand. 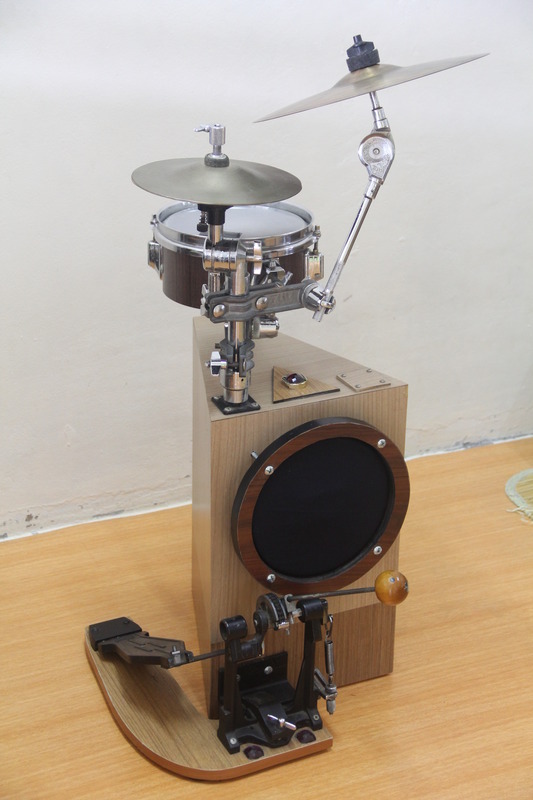 Last but not least, here’s a “vari-pitch” cocktail kit. 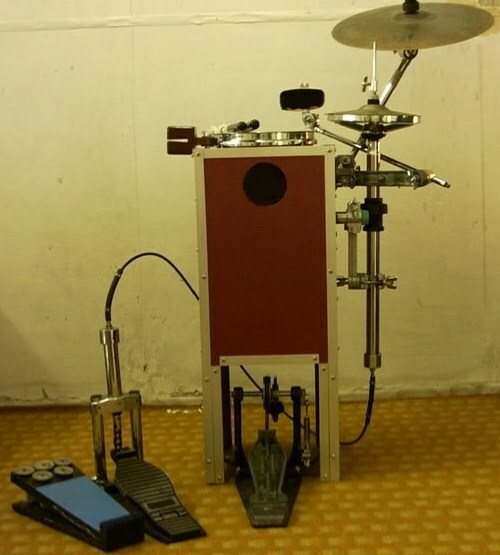 Who says effects pedals are just for the guitarist? 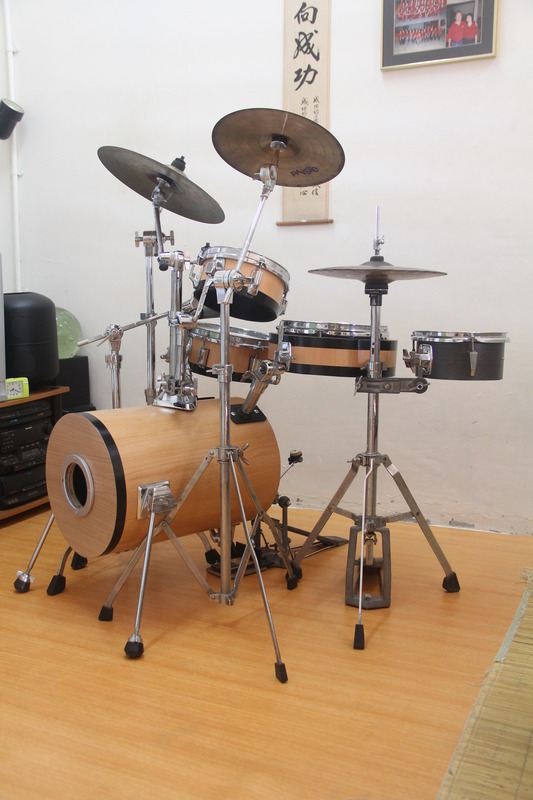 There seems to be no end to Peter’s creativity. 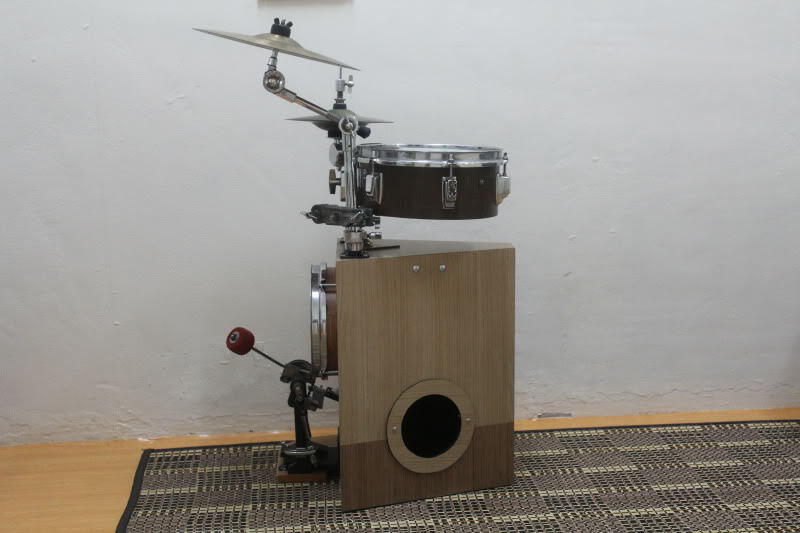 Just when you think all options are exhausted and there are no possible combinations left, somehow Peter comes up with an entirely new concept in compact drum kits. 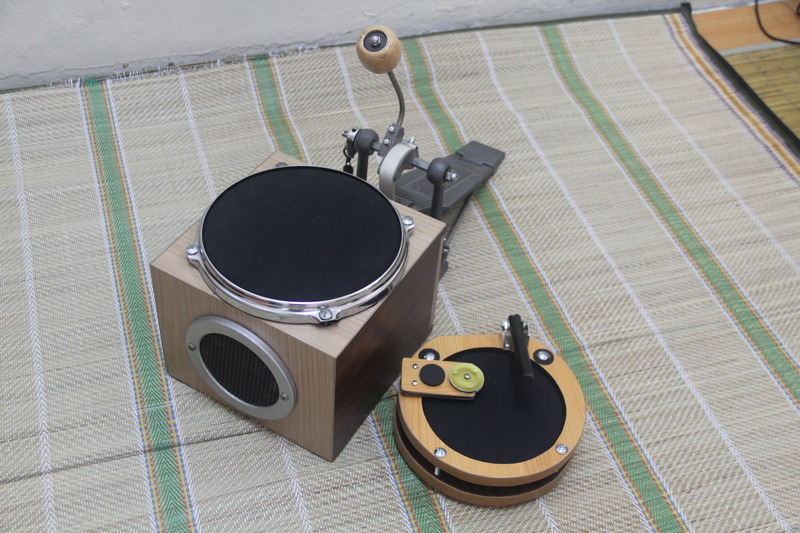 I had a blast putting together this compilation of some of the creations crafted so far and look forward to many more inspiring innovations from Peter Lau in the future.